Following the miserably lack-lustre performance at Tynedale, the Greens knew they had a point to prove – and how well they made it! The team-work and spirit missing last week was back in abundance and, while the visitors made the Dalesmen work hard for every point – and set up a nail-biting finale with a stirring fight-back from 28-8 down to 33-32 by the start of the final quarter – the victory was well-deserved. The match could hardly have had a more dramatic opening. The Leicester kick-off safely claimed, centre Tom Davidson broke into the visitors’ half. Slick inter-passing at pace, front-row men Jordon Poole and Ian Larkin prominent, ripped open the visitors’ defence. Flanker Lewis Wilson applied the finishing touch – with less than 60 seconds played. Stand-off James Guy struck a confident conversion. It took the initially stunned visitors only a few minutes to recover their poise. The first scrum of the game resulted in a 6th-minute penalty – achieved with ominous ease by the powerful Leicester pack – and was duly converted by stand-off and skipper Ricky Aley. Five minutes later winger Gareth Clark broke through an over-stretched defence for an unconverted try, and Leicester were ahead 8-7. Response was immediate by the Greens. A glorious purple patch produced 3 converted tries in a blistering 10-minute spell, leaving them apparently sitting very pretty at 28-8 after 24 minutes. First, prop Ian Larkin, then wingers Olly Cicognini and Ralph Wellock, finished off sparkling moves that had Leicester reeling and home supporters – especially those who had endured the debacle at Tynedale – pinching themselves to check that a first-half bonus point was for real! However, it quickly turned out that the visitors were not for rolling over. By the interval they had clawed back to 28-22 via a penalty try plus a fine score from substitute forward Gareth Turner. Aley converting both, and it was, most definitely, ‘game on’. The second half contributed fewer points, but lost nothing in tension. Aley took his personal tally to 12 points with a second penalty, plus the routine extras to his forwards’ second penalty try (62 mins). Meantime, Robbie Davidson had crashed through for a try (51), temporarily establishing a 2-score margin. At 33-32, and plenty of time left, the result was on a knife-edge. 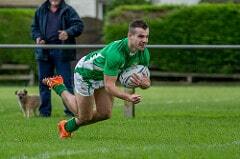 No 8 Josh Burridge’s try (68 mins) eased home nerves, but yet left the visitors within a score of victory. However, it was now becoming increasingly clear that the visitors’ previous scrum dominance was waning fast. Size was perhaps not everything, and having being hauled all over the pitch by the speed with which the Greens’ backs switched direction looked to be taking its toll. Anyway, at last the Greens had parity in the forward battle and they were able to enjoy the better of the hectic closing exchanges. Nevertheless, the jubilation that greeted the referee’s final whistle was mixed with a large measure of relief. Wharfedale: R Davidson; R Wellock, S Jordan, T Davidson, O Cicognini; W Lawn, J Guy; I Larkin (M Close 27), J Poole, T Asejevs, A Allen, E Ward, R Baldwin, L Wilson, J Burridge. Photographs of the match, as well as the previous ones, are available by clicking on Link to Flikr Album located beneath the Photos tab.